David M. Smith, 90, of Patchogue, LI, died on March 30, 2019. 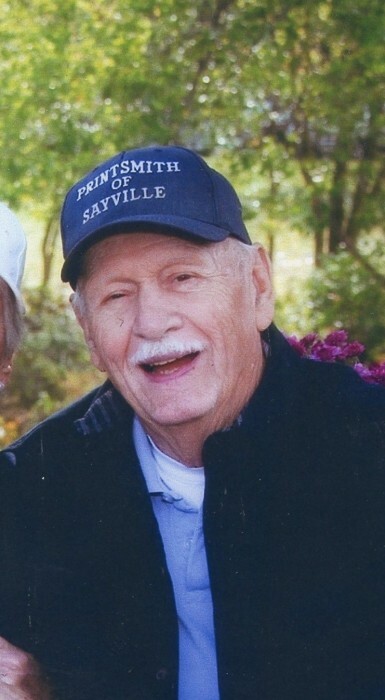 A longtime resident of the Sayville area, Dave owned and operated PrintSmith in Sayville for about forty years. He was also a longtime member and recently named an honorary member of the Greater Sayville Chamber of Commerce, as well as a member of the Sabre Club in Sayville. Mr. Smith was predeceased by his wife, Claire Eberbach, in 2017. He is survived by his six children, David and his wife Julie, Doug and his wife Lorraine, Donnalynn St. John, Dan, Diane Ardito and her husband Donald and Darren and his wife Mary; his nine grandchildren, David, Jackie, Christopher, Jennifer, Danielle, Rayanna, Mark, Matthew and Alan, his eleven great-grandchildren, David, Lucas, Kailey, Clyde, Nash, Matthew, Jaxon, Brayden, Savannah, Emerson and Harlow, as well as his longtime neighbor and companion, Valerie Field. Friends and relatives will gather at Raynor & D’Andrea Funeral Home in West Sayville, 2-4:30 & 7-9:30 p.m. on Tuesday, April 2nd where a service will be celebrated at 11 a.m. on Wednesday, April 3rd. Interment will follow at Calverton National Cemetery.